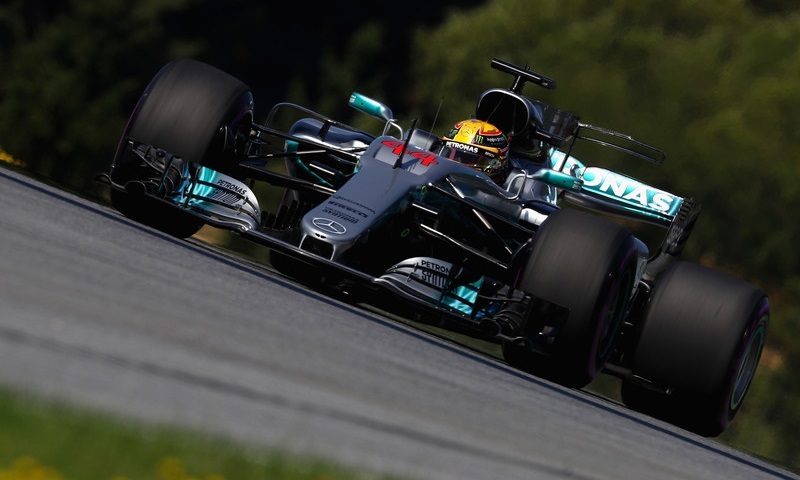 SPIELBERG, Austria — Lewis Hamilton swept Friday practice for the Formula 1 Austrian Grand Prix, but a competitive day of action at the Red Bull Ring ultimately saw a scant four tenths of a second separating the top five cars. Hamilton posted the top lap of the day in the second practice round, lapping the 4.318-kilometer circuit in 1:05.483 at the wheel of the No. 44 Mercedes AMG Petronas entry, an unofficial record around the current configuration of the Spielberg circuit. The Briton is the defending winner of the Austrian Grand Prix, and Mercedes has won every running of the event since the race returned to the Formula 1 calendar in 2014. Hamilton set his top lap on Pirelli’s ultrasoft tires, but needed to have a spark plug changed and later complained of a power surge issue which was particularly noticeable in Turns 3, 4 and 6. He also had a minor off in Turn 1, while teammate Valtteri Bottas spun in Turn 6 and also went off in Turn 9. In the end, though, it was Ferrari’s Sebastian Vettel who landed second-fastest on the charts, with a time of 1:05.630 that was just .147 of a second off of Hamilton’s leading mark. Bottas was third despite his issues, ending on a lap of 1:05.699, followed by the Red Bull pair of Max Verstappen and Daniel Ricciardo in fourth and fifth. The sister Ferrari of Kimi Raikkonen, Haas’ Kevin Magnussen, McLaren-Honda’s Fernando Alonso, Renault’s Nico Hulkenberg and Romain Grosjean in the second Haas car rounded out the top 10. Thanks to an incident-laden second practice session, nearly every driver had issues of one form or another during the day. Vettel had a half spin in Turn 3, while Verstappen lost a lot of the session having a brake problem rectified. Alonso lost time having floor damage repaired on his machine, spun after going off in Turn 6 and later ran wide in Turn 9, but still managed to land eighth overall. Daniil Kvyat battled a rear brake fire late in the session, while his Toro Rosso teammate Carlos Sainz went off in Turns 9 and 10. Marcus Ericsson spun in Turn 1 and also went off in 4 and 6, while Force India’s Sergio Perez, Sauber’s Pascal Wehrlein and Grosjean all went off at Turn 9. Grosjean also went off in Turn 10, as did Verstappen before the end of the second round.